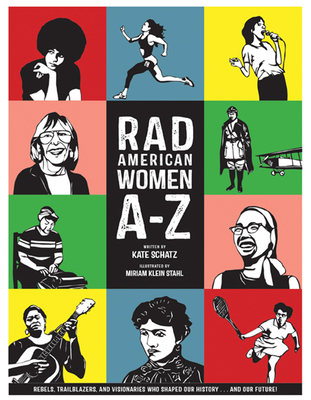 Like all A-Z books, this one illustrates the alphabet--but instead of "A is for Apple," A is for Angela--as in Angela Davis, the iconic political activist. B is for Billie Jean King, who shattered the glass ceiling of sports; C is for Carol Burnett, who defied assumptions about women in comedy; D is for Dolores Huerta, who organized farmworkers; and E is for Ella Baker, who mentored Dr. Martin Luther King and helped shape the Civil Rights Movement. American history was made by countless rad--and often radical--women. By offering a fresh and diverse array of female role models, we can remind readers that there are many places to find inspiration, and that being smart and strong and brave is rad. Kate Schatz is a writer, editor, and educator. Her book of fiction, Rid of Me: A Story, was published in 2006 on Continuum Press as part of the acclaimed 33 1/3 series. She is the author of Rad Women Worldwide. Her writing has been published in Oxford American, Denver Quarterly, Joyland, and West Branch, among others, and her short story "Folsom, Survivor" was included as a 2010 Notable Short Story in Best American Short Stories 2011. She is a co-founder and editor of The Encyclopedia Project. She taught at the School of Literary Arts at Oakland School for the Arts and received her MFA in Fiction from Brown University, and a double BA in Women's Studies/Creative Writing from UC Santa Cruz. She lives with her family on the island of Alameda. Miriam Klein Stahl is a Bay Area artist, educator and activist. In addition to her work in printmaking, drawing, sculpture, paper-cut and public art, she is also the co-founder of the Arts and Humanities Academy at Berkeley High School where she's taught since 1995. She illustrated the book Rad Women Worldwide. As an artist, she follows in a tradition of making socially relevant work, creating portraits of political activists, misfits, radicals and radical movements. As an educator, she has dedicated her teaching practice to address social inequity through the lens of the arts. Her work has been widely exhibited and reproduced internationally. She lives in Berkeley, California with her family.